The Food and Drug Administration launched a wide-reaching campaign last week aimed at educating teens about the dangers of e-cigarettes. Part of a broad effort by the agency to decrease teen nicotine use, the campaign uses the tagline “Know the Real Cost of Vaping” and will include posters about the dangers of vaping in 10,000 high school bathrooms. The FDA will also share the messages on a website and social media platforms including YouTube, Spotify, Pandora, Facebook, and Instagram to further target kids ages 12-17. The warnings to students are part of an “aggressive” plan by the FDA alleging that youth use of Juul and similar products “is reaching epidemic proportions.” Earlier this month, the agency gave e-cigarette makers 60 days to show they are taking steps to prevent minors from using their products, and it threatened to pull some of their flavored merchandise off the market or bring criminal or civil charges against manufacturers that fail to comply. FDA Commissioner Scott Gottlieb has expressed concern that some flavored e-cigarette products appeal specifically to young people because they taste like candy and other treats. The campaign’s key messages will be about the science of nicotine addiction and the fact that e-cigarettes often contain other toxic chemicals such as lead and formaldehyde. The $60 million effort uses funds collected from the tobacco industry, and materials are being created in collaboration with Scholastic and Students Against Destructive Decisions. The move is in line with what one national education official who encountered Juuling last year says is the most effective way to curb the problem. “The big focus was primarily on education, because we realized that our students did not really understand … the dangers of these substances that they were using and putting in their bodies,” said Christine Handy, president of the National Association of Secondary School Principals, who last year was principal at Gaithersburg High School in Maryland. Many students who try Juul don’t realize the product contains nicotine, Handy said. In reality, a few puffs on a Juul gives users a “very quick and powerful burst of nicotine,” more similar to that of a conventional cigarette than many other e-cigarettes offer, according to The New York Times. That also makes the product more addictive for young people, researchers said. Nicotine has been shown to cause permanent damage to young brains. While students sometimes faced detentions or other consequences for Juuling on campus, Handy mostly focused on arming students and parents with facts, which is in line with her district’s restorative approach to discipline. High schoolers tend to tune out adults telling them what to do, Handy said. They “don’t always believe everything that we say,” she continued. “They think we just don’t want them to do it, so we began to use that student voice to help educate other students” about vaping, such as by having them create posters to hang around the school or taking high schoolers to teach middle school kids what they learned. That approach is different — and more effective, Handy says — than the simplistic “Just Say No” anti-drug campaigns of the 1980s and 1990s. Educating parents is also a crucial part of principals’ strategies. Handy said principals she knows sent letters to parents at the start of the school year explaining what Juul is and how to recognize it. Many of them were unfamiliar with the device when she called last year to inform them that their children had been using Juul on campus. Handy said one difficulty she faced was knowing when students were using “other substances” in their e-cigarettes. While Juul does not sell any products containing marijuana, some e-cigarette manufacturers do. Almost 9 percent of middle and high school students say they have vaped marijuana, according to recently released findings from the 2016 National Youth Tobacco Survey. Since gaining popularity — and scrutiny — Juul has made an effort to be more transparent. Now, the company’s Instagram posts contain warnings in large font about the nicotine content of its products, and, according to the company’s website, it is committed to featuring only real former smokers who have switched to Juul in its social media posts. However, unofficial Juul fan accounts and individual users continue to show young people using the product — without safety warnings — and a number of companies have begun selling copycat products. Juul Labs says that the company employs a team to identify inappropriate social media content related to Juul. “We cannot be more emphatic on this point: No minor or non-nicotine user should ever try JUUL,” Victoria Davis, a Juul Labs spokesperson, told The 74 in an emailed statement. Davis also said in the email that the product’s success hasn’t come from marketing efforts but rather word of mouth among adult smokers who use the product. 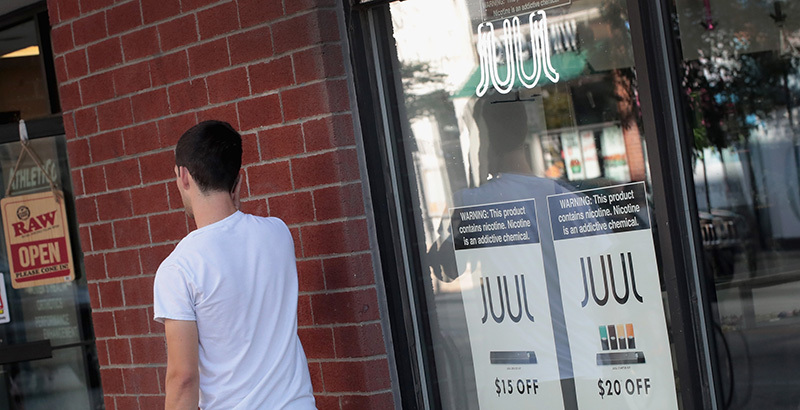 According to its website, Juul has procedures to prevent youths from buying its products illegally and supports legislation to enforce those efforts. However, a study by the Truth Initiative, a nonprofit organization dedicated to ending all tobacco use in the U.S., found in April that nearly a fifth of middle and high school students had seen Juul used in school. The product grew rapidly in popularity over the past year and now makes up more than half of the market share of the e-cigarette market. That suggests Juuling is not a passing fad, said Truth Initiative COO Dave Dobbins. “There’s nothing in the sales data or the prevalence data and what we’re seeing in trends that indicates that it’s something that’s coming and going,” Dobbins told The 74.